Armament: Two 3"/50 dual purpose mounts. Propulsion two Babcock and Wilcox header boilers, one 1,400shp Baltimore Dry Dock and Shipbuilding Co. 200psi saturated steam vertical triple expansion reciprocating engine, one shaft. 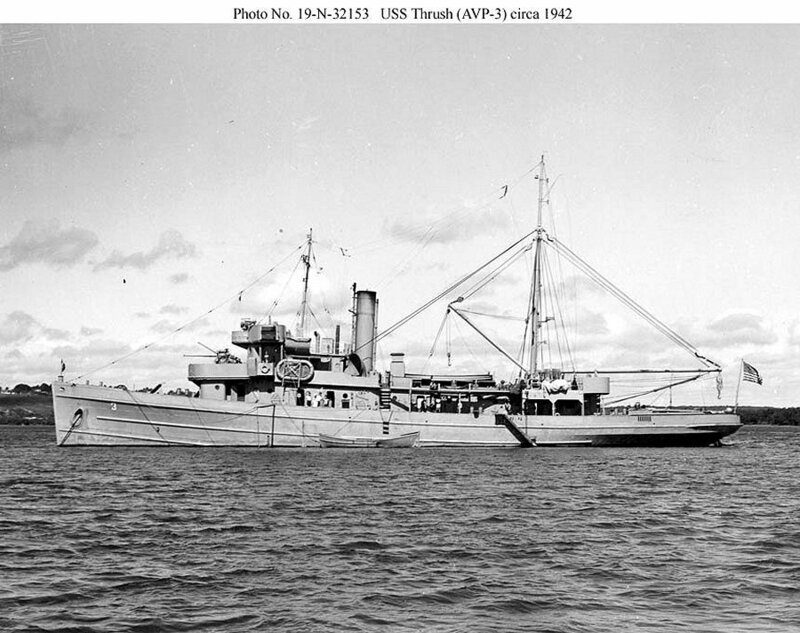 The seaplane tender AVP 3 Thrush performed duties at San Juan, Puerto Rico, and in the British West Indies until she departed Trinidad on 28 November bound for Brazil. She arrived at Para on 7 December 1941, the day Japanese planes swept down on the American base at Pearl Harbor in a devastating raid which plunged the United States into World War II. 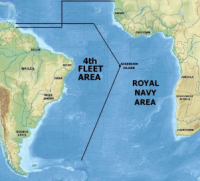 Thrush conducted wartime patrols out of Para before moving her base of operations to Natal, Brazil, on 20 December. Refueling planes, carrying supplies, and serving as a seagoing "jack-of-all-trades"(even as a floating radio station upon occasion). Thrushcontinued operations off the Brazilian coast through the early spring of 1942. On 18 May, Brazilian Lloyd steamer SS Comandante Lira fell victim to a German U boat's torpedoes off Cape San Roque, Brazil. Thrush responded to the merchantman's signal requesting assistance. When she reached the burning ship, she sent over a salvage party to fight both the flames which blazed in two holds and the flooding which had already entered several compartments. The seaplane tender passed a towline to the stricken merchantman and towed her 200 miles to Fortaleza Bay. 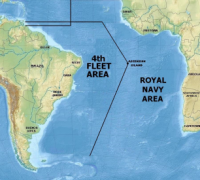 The ship continued operations out of Natal and Recife, Brazil, through October 1942. She departed Fortaleza Bay on 14 October, bound, via Trinidad and San Juan, for Norfolk. Arriving at Hampton Roads on 1 November, the ship underwent an overhaul and upkeep period at the Norfolk Navy Yard before 12 days of gunnery training and other exercises in Chesapeake Bay through 26 December. The ship then called at Mayport and Jacksonville, Fla., before arriving at San Juan on 8 January 1943. Pressing on to Trinidad, Thrush spent one week at the British West Indian port before heading for Brazil and arriving at Belem on the 26th. 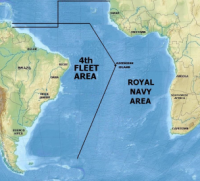 She then operated off the coast of Brazil escorting coastal convoys until 4 April, when she departed Belem and proceeded homeward (via Trinidad, San Juan Guantanamo, and the Windward passage) and reached Norfolk on 22 April.